Fashion college student in a gothic punk ensemble with patent leather pants, tank top and accessories. Harajuku girl in an all black fashion with bomber jacket while out and about on the street. Harajuku girl in cardigan over graphic print collar dress, mismatched knee high socks and platform boots. 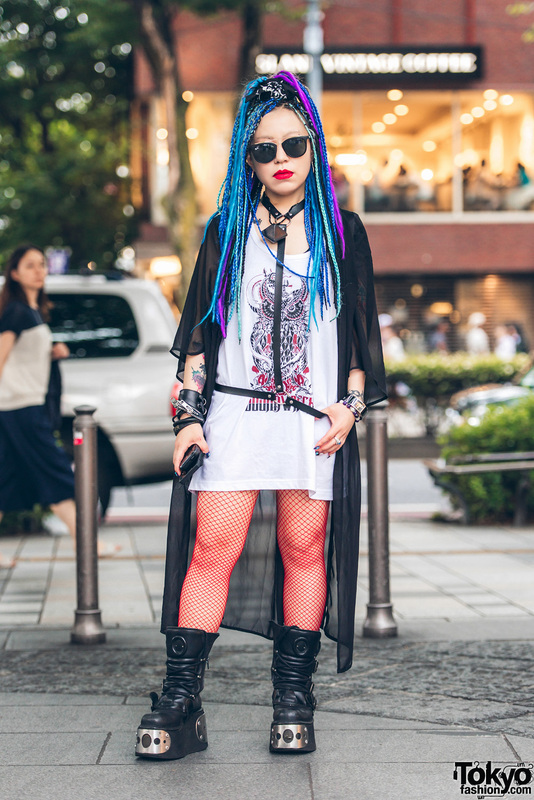 Harajuku model with purple blue pastel hair wearing a leather biker jacket with a red camisole, a leopard print maxi skirt, boots, and Vivienne Westwood accessories. Punky short-haired Harajuku girl in kanji print shirt and denim cutoffs, with bone necklace, studs bracelet and platform boots.